Sagittarius (the Archer) is at best visibility this month, rising high in the south. As with most constellations, light pollution prevents you from seeing the fainter stars that comprise the Archer’s shape. 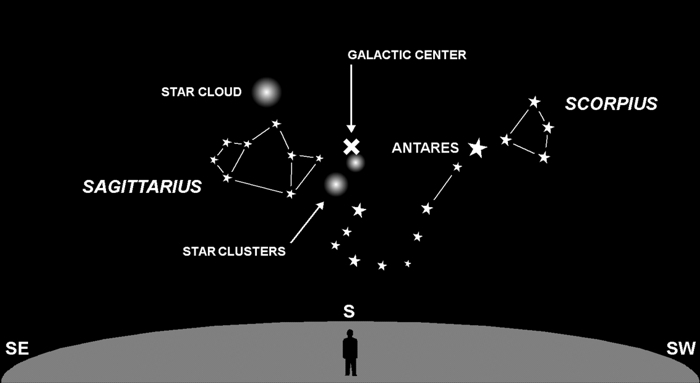 What remains is an asterism, a subset of the main constellation that resembles something else. And what it most resembles is a teapot. But wait … there’s more. This teapot is ejecting “steam” from its spout. And what looks like steam to the naked eye, binoculars will reveal as myriad stars in a dense cluster. Three such clusters lie adjacent to the teapot, and they are truly beautiful objects when seen with just a little magnification. If you have binocs, take a closer look. This is one of the richest areas in the sky, filled with stars, star clusters, nebulae (gas clouds), and dust. The reason for this richness is that, when you look toward Sagittarius, you are also looking toward the center of our Milky Way galaxy. The galactic center itself is shrouded in dark clouds of dust that prevent a direct view, but there’s still a lot of other objects visible between here and there. What we would see if those dust clouds were not in our way will be the topic of next week’s column.